Oh Snaps! 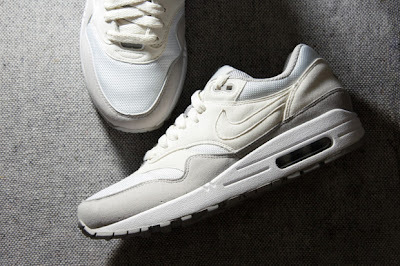 That's tight...: Nike Air Max 1 - "Milky"
Asphalt Grey, Cream, and White colorway of the famed Nike Air Max 1's are looking good. Unfortunately, these are a Woman's only release - but let's be honest, its not like the fella's out there have never added +2 to their shoe size and copped kicks made for chicks before, right. Right? Oh its just me? Nevermind then. Um - cop "your girl" a pair here. Pic via Hypebeast.